Note: I am a not an AAC expert, though we have worked with one along the way. If you think AAC will be useful for you, your child or someone you work with, find a Speech and Language Pathologist (SLP) who is experienced and knowledgeable about AAC. Augmentative and Alternative Communication (AAC) is basically a catch-all term for any number of ways that people with speech or communication difficulties can use to communicate. This ranges from sign language, to picture exchange systems like PECS, to specialty talking devices. 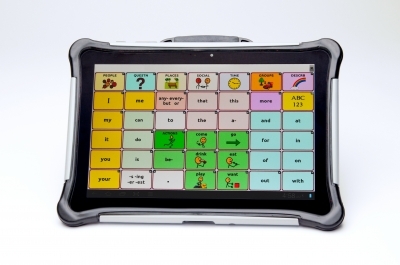 Using AAC doesn't necessarily mean choosing only one thing. Like all of us, people with communication challenges may use a variety of ways to communicate. Moe, for example, uses a combination of ASL signs, gestures like pointing and nodding or shaking his head, and some word approximations. But they key here is that Moe wants to communicate. Until now, we had never done any formal AAC programs with Moe because he never seemed to catch on. Maybe we didn't stick with it enough, or maybe we were still unsure how to proceed. But Moe is getting frustrated a lot lately. He is getting older and his needs are more complex. He needs a way to communicate with us consistently. We decided we wanted to take a look at a "talker," a device that would allow Moe to have a voice to communicate with those of us who know Moe well, as well as others in the community who might not understand his signs or sounds. Talkers come in two basic varieties: stand-alone devices and apps. Several companies, including Saltillo and PRC make stand alone devices, although the state of this business is changing. In fact many devices, like the Springboard and Vantage, that were once staples in the AAC world just a year ago, have been discontinued. I suspect this is because it is much cheaper and easier to for a company to make an app for a tablet device than to manufacture and support custom hardware. Example of a "stand-alone" device. NOVA Chat 10 from Saltillo. Today, most of these "stand alone devices" are modified Android tablets that have the communication app loaded onto them and are outfitted with a strong integrated case. Although the Saltillo rep claimed there is more to it than that - that the hardware itself has been altered as well - I suspect most of the hardware work is on the case. There are several benefits to this kind of device. They tend to come with more support and training from the device company, and often are available in several form factors. Most are made by companies that have been in the AAC business for a long time, and the new devices are their next generation solutions. Companies will often allow 30 or 60 day trials with loaner devices as well. These stand alone devices are very expensive, costing $3,000-$5,000 or more. However, it tends to be easier to get insurance coverage for the stand-alone devices. There are many apps that can be purchased and loaded on iPads or Android devices. This approach seems to be where most of the action is these days. Custom hardware is complicated to make and expensive to support. By creating an app for sale in the Apple or Google store, AAC companies can reach many more customers and lose the overhead of device manufacturing. For a user, there are several benefits to getting an app instead of a stand alone device. There are lots of apps to choose from, since the barrier to entry is much lower. Because of this competition, as well as the cheaper production cycle, the apps are less expensive than the stand alone devices, and bugs can be fixed and turned around relatively quickly. In fact, if all you need is a simple app, you may be able to find something inexpensive or even free. Many of the apps also have free "lite" versions that will allow you to see what the app is about before purchasing. The downsides are significant, however. Because there are many to choose from, it is harder to know which ones are from reputable companies that will be around to support their app, make updates or fix bugs. It is also harder to know how the apps really work as the lite versions are often not fully featured. App creators don't support the hardware, of course, and may not provide customer care beyond an email address or web form. And although cheaper than a device, the more robust apps still cost between $200-300. Add the cost of an iPad and high quality case (like the iAdapter), you could be approaching $1,000, and it is harder - though not impossible - to get insurance coverage for iPads used as communication devices. Stay tuned for Part 2: An overview of the devices and apps we saw during Moe's AAC evaluation and what we selected. Can't wait to hear which you selected. Our 5-year-old son uses PECs and is ready for the next step too. So far I think that the LAMP Words for Life might be the best option for him- but I'm anxious to hear your thoughts, since our boys sound pretty similar! Good luck! I've never really understood why it wouldn't be preferable to use an iPad or other tablet to one of those standalone devices you talked about. It just seems like that functionality is already built into a less expensive device that does way more. I get the part about the reputable companies, but it seems like once you have that figured out it would be a slam dunk. Not sure how I missed this one! Actually, the Saltillo rep is correct; they have to do significant modifications on hardward, not just cases, to make them robust enough to make it through 8+ hours of intensive use on a daily basis. The batteries are often specially designed for extra long life. Plus, many of them have been modified in order to lock out the features which make the tablet-based devices just like an iPad. In many, may cases (varies by state), insurance will not cover a non-dedicated device. We have both an ipad and a Vantage Lite device. My complaint about the use of an ipad is that my son really needs a fully dedicated device for communication. There are so many great apps out there, but there are also some really crappy ones, too. (I could send you those names offline!) It's a crapshoot and, as you said, insurance is reluctant to pay for those things. I like that Nik can be doing somethign on his ipad and either ask for help, or tell me somethign completely unrelated, using his "talker." I know PRC is replacing the Vantage Lite (and the Springboard) with their Accent series. I'll be eager to check out the Accent 1000 (10 inch tablet) once it's out. Nik already has such tremendous facility with the Unity language that it doesn't make sense to force him to learn another one unless we have to. This is really timely! My youngest was just diagnosed with childhood apraxia of speech, so we're starting to research AACs for him to use while we work on verbal speech.